"There are grey nurse sharks at Magic Point"
This dive site is located 176 kilometres from Port Douglas. It is located at the southern end of Ribbon Reef No 10 at a GPS Reading of S14° 54' 56.9" E145° 41' 26.6" using WGS84 as Datum. It is a small reef off the inside of the main ribbon reef. The dive site is on the north-western corner of this unnamed reef. It is about 40 kilometres south east of Lizard Island. The reef in this area runs north-east to south-west. The reef top is about 5 metres and the bottom of the reef about 12 metres to the NE and 8 metres to the SW. From here it slopes on a sandy bottom to 20 plus metres. There are a couple of bommies off the wall and these have some nice growth. There are garden eels on the sand. However, the best spot is the main reef. There are a number of moorings at this location as it is a popular dive site for liveaboard boats. From the mooring at the GPS location given, explore the sand below the boat for garden eels. Then head to the east till you hit the main reef. Follow this in either direction. The reef has excellent coral life, with many different species. There are lots of nooks and crannies to explore. These have lots of fish. 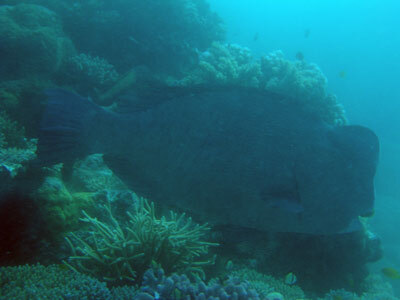 We saw at least 10 to 12 double humped parrotfish at this site.These can cause a lot of damage to the reef as the quite viciously attack the coral when foraging for food. 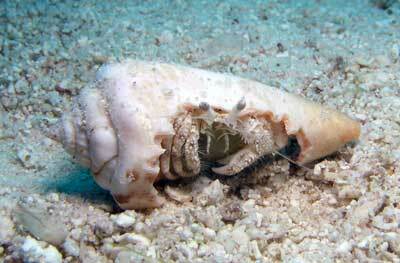 You will see the damage made by these fish all over the place (they each eat 4,000 kilograms of coral a year!). Some sections of the reef have gullies that are dead ends so you may need to backtrack. Others lead through to more gullies and back to the main reef. 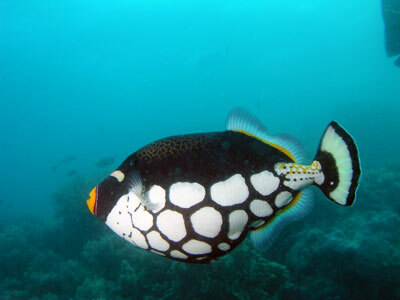 Fish seen here include the very beautiful clown triggerfish, barracuda, large schools of giant trevally, red bass and more. 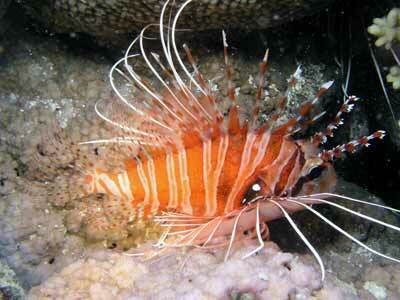 This site is also done as a night dive. However, one problem is that because so many divers do night dives here, some larger predatory fish have figured out that when bright lights are pointed at small fish, it helps them attack and kill them. 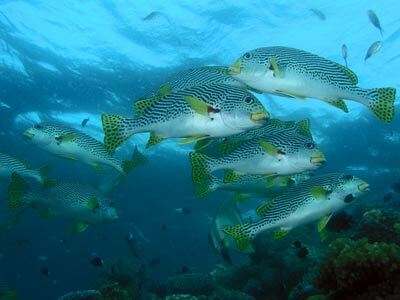 The main problem fish are the red bass and giant trevally. The red bass are particularly bad, hunting in seemingly large packs, chasing any fish that happens to be caught, even for a split second, in the beam of a diver's light. As such, you need to quickly move your light off any smaller fish that might be caught in your light. The red bass will even come and stick their heads inside cracks and overhangs if you shine your torch there. They look evil, almost vampirish as they have upper teeth that protrude over their bottom lips and this seems more prominent at night time. With a little care, you can prevent unnecessary blood being spilt. That being said, this is an excellent night dive. Lots of things to see, including heaps of shrimp (red banded and other species), huge marbled moray eels, firefish, small crabs and different species of pufferfish. You will also see lots of fish hidden in the coral, away from the maurauding red bass. With a little luck you might also see a white-tipped reef shark or two patrolling along the reef edge or top. A great night dive and a great day dive. Visibility can be a little less than other spots as it is near the gap between Ribbon Reef No 9 and Ribbon Reef No 10 and water flows past the small reef to get to and from this entrance from the open ocean. 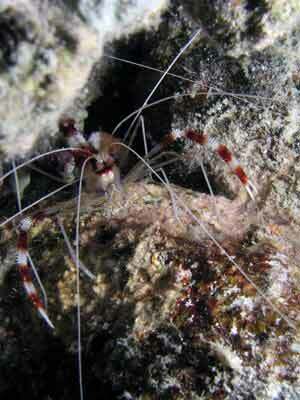 However, on my two dives here we had between 15 and 20 metres.